Delicious hot or cold in salads or sandwiches! Once opened, consume within 2 days., Keep refrigerated (0 to 5°C). Do not exceed use by date., Suitable for Home Freezing: Freeze on day of purchase. Use during first month. Defrost thoroughly before use and consume immediately. Do not refreeze. Microwave (From Chilled): 800w: Remove from pack, and place contents on to a microwaveable dish. Cook on full power for 90 seconds. 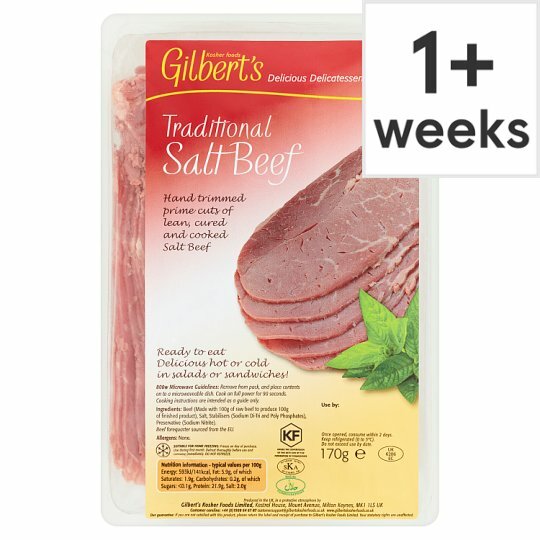 Our guarantee: If you are not satisfied with this product, please return the label and receipt of purchase to Gilbert's Kosher Foods Limited. Your statutory rights are unaffected.